It’s been a while since I’ve written anything here. I have two or three posts almost complete but for one reason or another I just have not felt ready to publish. I’d like to go into the details of my absence, but I can’t say too-too much except that I’ve had some personal / family-related things come up that needed to be addressed and so pretty much everything in my life went on hold except this situation and the bare essentials: work, kids, some sleep and if I do feed myself it’s erratic at best (I’m still noshing at midnight). I will say it’s not my husband or kids–they are all fine, knock wood–but it did give me time to think and reflect on what is truly important, especially in the spirit of “giving,” which is the context of this blog. So whether you call them collectors, hoarders, pack-rats or whatever other term du jour is in vogue, hoarding is a progressive, disruptive and destructive condition that traumatizes anyone and everyone it touches. It’s easy to get caught up in the sensationalism of the malady from reality television or even parody th e neurosis (for example, I did a search on twitter for “Hoarding” and got tons of profile results of people claiming to be lipstick hoarders and beauty sample hoarders etc, it may seem kitschy but it trivializes something that’s still not fully understood); but it’s a nightmare that leads to bankruptcy, eviction, homelessness and even death. There is an incredible and overwhelmingly supportive hoarding recovery community online who are loving, willing and full of resources and experience. But here is what I truly found staggering: the statistics around recidivism (it’s nearly 100% for hoarders who do not get help and do not change their environment), and how closely the symptoms of hoarding resemble drug and alcohol addiction (instead of drink or a hit on a pipe, the “stuff” or sometimes even shopping or adopting an animal is their fix). So, there are many ways to give–things are an example–but time, love, compassion, honesty, willingness, forgiveness are others–I’ve recently learned distance can be a gift of sorts too, but that’s for another time. So for those who accumulate to their detriment, rethink before adding to their clutter and consider another type of offering. What would be the best way to show your care–that you know who and where they are? As for me, and inasmuch as I can share without impacting the privacy of others, I was not terribly successful in my venture, but I did learn more about my own boundaries, that memories are not bound by possessions and relationships that are based on obligation do not lead to unconditional love–it is when you build a relationship based on unconditional love that one will be devoted and not feel obligated ever. All good to know, life lessons. 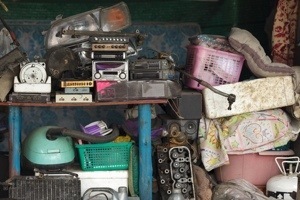 If you believe you or someone you love may have a problem with hoarding, you can find help, resources and information at these organizations Help For Hoarding, the National Association of Professional Organizers and ChildrenofHoarders.com.